Can I tell you why this could be the shoe that I've been searching for my whole life? I love a gorgeous shoe. Nay, I have a passion for gorgeous shoes. Way back when I was a fab young thing, I'd spend a disproportionate amount of my earnings, on shoes. To this day, when dressing each morning, I spend more deciding which shoes to wear, than anything else. An increasing waistline, and a number on the scales that still surprises me (and not in a good way! ), means that for the most part, I had abandoned my shoe fetish, and resorted to 'anything that doesn't cripple me'. But a recent revelation from some more savvy fashion folk than I, made me zoom in on my keyboard, searching 'Medium Heel Peeptoe Shoe', like there was no tomorrow. See, first up, we curvy girls of the 'under 5'5" range, need a bit of height to lend a slender illusion to our frame. But frequently, that means tottering around in heels that see us looking more like an oversized body on a pair of pins, than we would prefer. A gentler look, and one that sees us walking more elegantly, is a wedge heel, or a conical or block heel. We still gain height (AKA long and lean), but we walk more gracefully, and do not look like we're walking on chopsticks in the process. Additionally, we seek an open look shoe, without straps, ankle straps or T-bars, that would shorten the look of our feet, to add that much needed loooooong look to our feet and legs. 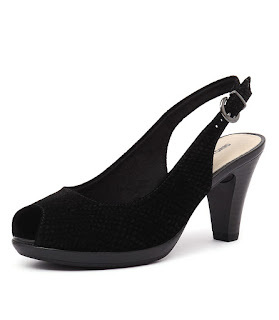 But plain old court shoes (pumps) can be a little granny-ish in a lower heel, yes? A cute peeptoe cutout is one answer I've found. Keep the peeptoe cutout small, to give your feet a dainty look, and aim for some 'toe cleavage', where the joins between your toes, show in the open part of the shoe from top view. This gives that lovely loooooong look that we petite curvy girls need. 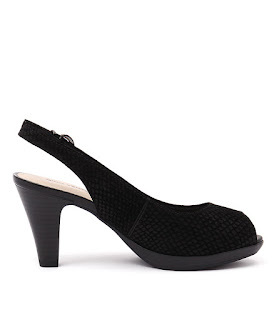 A slingback as opposed to a closed in heel, is a nice youthful look that will take you anywhere. This style of shoe, will allow me to wear skirts and dresses with confidence (so long as they are knee length, or just below and no longer), knowing that I have my bit of height, and a long and lean look to carry it off. I found my dream shoe online eventually, staying focused, checking heel heights, and looking for just that perfect combination of toe cleavage and peeptoe. I was finally rewarded as you see by the pictures here. This style is by Gino Ventori and it's called Foxy Black. I bought mine from Style Tread here in Australia, and they were $169.95. I call that a bargain for the number of times I plan to wear these little pretties! Those shoes really are rather lovely. Are they suede. If they are get them waterproofed before you even think of putting them on your feet. According to my reading I can wear heals or flats. I have been through my wardrobe and have two lovely cocktail dresses if I had something special to attend. I would have to go barefoot or in my pink thongs, not a good look. Now I am going to have a good look around for some nice evening shoes. I want a small heel as I am already taller than my husband and don't want to tower over him. Time to have a bit of a play. Great shoes Mimi. Is it a 2" heel? I'm sure you will get a lot of wear out of them. Very pretty! I can see those going with tons of outfits and being easily dressed up or down as needed. Where I live they'd have to be saved for warmer weather, as peep toes and sling backs don't play nicely with snow and ice. Ah, well. Spring will come!